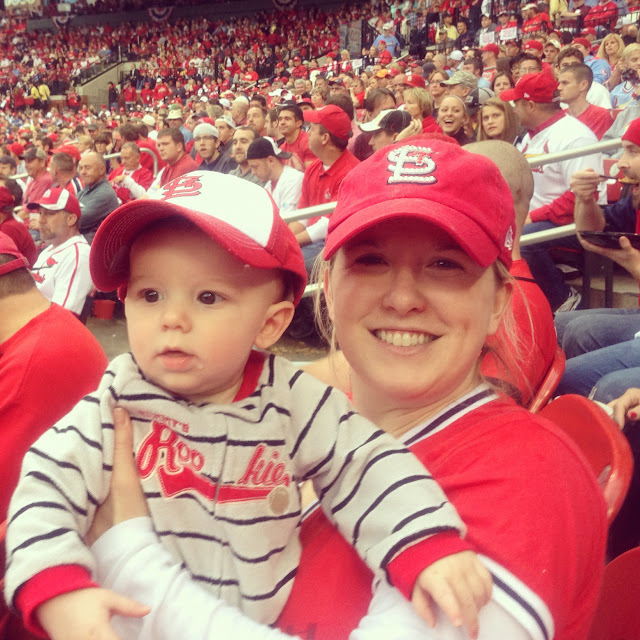 ONE - We're taking Mac to a Cardinals vs. Cubs game on Sunday and we are SO excited! It's at exactly the time he usually takes his afternoon (only) nap, so we may be in for a miserable evening (post-game), but I think he's going to love the game! He loves to clap and cheer, so I hope they score a lot! The last time he was at a game he looked like this - so tiny! 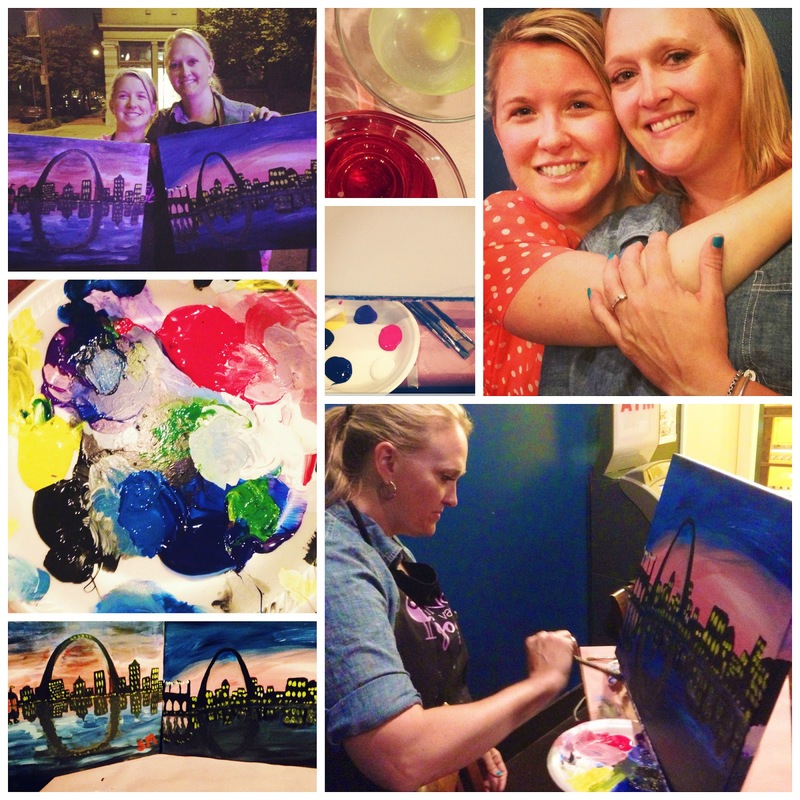 TWO - Our Vino Van Gogh class last night was so much fun! Great drinks, great company. Although, I can say that I'm unfortunately going to make it in the world of art. My St. Louis skyline didn't turn out quite good as I'd hoped - not that I was expecting much, but apparently I'm much worse than I ever imagined I would be. Ryan said it looked like the city was flooded. Ugh. Well, at least there was booze. THREE - My in-laws just got a new Golden Retriever puppy. Her name's Millie. She's the cutest, tiniest, goofiest little fluffball with the most wonderful warm puppy breath. She trips over her own feet when she runs and gives the best ear kisses. So now I have major puppy-fever, in addition to my regular baby-fever. FOUR - Did you know that Saturday is National S'mores Day? Oh yeah. I'm a sucker for anything chocolate/marshmallow. I'll take anything s'mores related, but I'm not sure you can beat the traditional campfire, burnt marshmallow, cold chocolate bar S'mores. I think we're going to need to get the firepit in our backyard up and running this weekend. How are you going to celebrate? FIVE - I've started noticing people pinning Halloween costumes lately and I've already started to freak out a little about what Mac's going to be. Not sure how we'll ever top last year's costume. Let the brainstorming begin. That costume. OY. So cute. Girl, you'll never top that freakin' awesome costume from last year. Dont even stress. That was LEGENDARY. I just found your blog and I love it! I opened it and immediately saw the Cards hats and I gasped. We are HUGE Cardinals fans! We were stationed at Scott AFB for three years and moved away a few months ago and miss St. Louis like crazy. My baby is just a few weeks younger than your baby! AND I'm a lawyer too (unemployed because my husband makes me move too much)! I'm also freaked about the Halloween costume dilemma. It hit me a couple days ago that I need to start planning and now I'm overwhelmed. Anyway, I just wanted to say that I love your blog and I think you and I have a lot in common. I'm excited to follow you! Have a great day! Halloween costumes, oh my is it really time to start thinking about this!? I've determined that Avery is going to be a cowgirl. The cheese costume really was precious!! Where to begin....... I wanted to start at the top, but then HIS HALLOWEEN COSTUME. Oh my gosh, I love what he wore last year! Perfection!! Hope you guys have a great time at the game - hopefully he'll surprise you and take a quick nap on the way to the game and be okay. Funny how quickly life changes and you're working around a mini person's nap time! 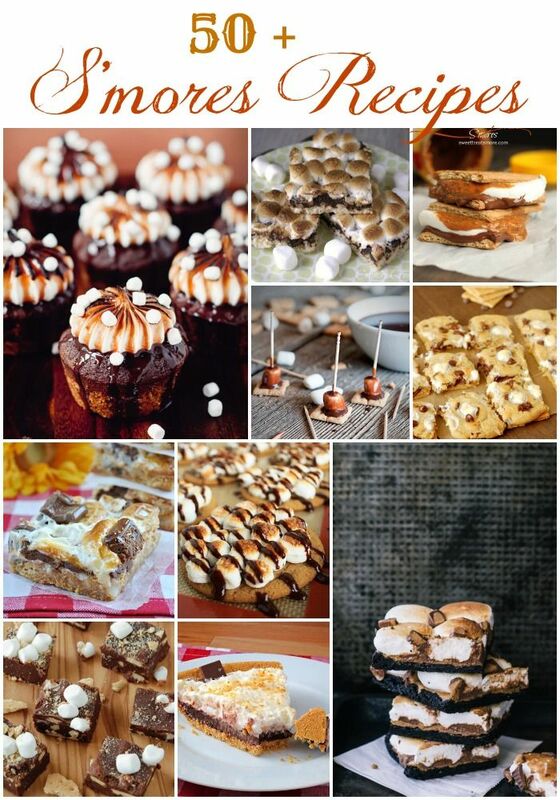 And you just made my entire weekend by making me aware that Saturday is National S'mores Day. No, but really - you seriously did. SO HAPPY about this! haha how did I not know you did that for Mac's halloween costume! So adorable and that puppy, omg! I think your painting looks great. I can only imagine how I would do, I really have zero artistic ability. I think mine would have looks like lego blocks floating on water. lol. have a great weekend! Mac and Cheese?! Omg, thats amazing. BTW, I think your skyline looked just fine -- its much better than I could ever do! I totally forgot about the awesomeness that was Mac's Halloween costume. There's just no topping that. You could do "chili mac" or "old MAC donald"? I don't know. I'm having a hard time with ideas for D too. Last year he was Superman/baby since we had a hand-me-down costume. This year I have no clue. National S'mores Day?!?!? Oh my! I think this calls for a celebration! ;) LOVE the Halloween costume! I'm sure whatever you come up with for this year will be just as cute! Happy Weekend! a national smores day???? who knew that even existed???? that totally makes the weekend even MORE exciting!!!! That costume was amazing!!! I'm with you on the no idea what to do for this year! Randomly enough I did know that Saturday was national s'mores day and you better believe I'll be celebrating! You're right, you set the bar high with that first Halloween costume!!! Have so much fun at the game!!! Your night looked like so much fun! I kept showing the hubs all your IG pictures, telling him *I* needed to do something like that with my girlfriends too. I've been racking my brain for Halloween ideas, too. I'm still clueless as to costume ideas, but I'm sure Pinterest will save me. oh the halloween costuming begins...how will Mac ever top his "mac & cheese costume?" and how will Elyse ever be any cuter than as a pint-sized peacock? Springfield has one of those paint places, but I'm not thinking drinks are included---if I ever did that I'd definitely have to drink something beforehand, at least I could blame my lack of artistic ability on being a bit tipsy! That. Dog. So cute! Have fun at the game!! Mac n cheese!! Gah!! Awesome. Cheers to the weekend and s'mores celebrations! We are going to the game tomorrow! Nope, can't ever top the first year's costume so don't even try! Too many years to plan after the first, anyway;) Love it. Oh, my goodness! That little Mac 'N Cheese! So precious! Can't wait to see what you come up with for this year. So excited for you guys going to the Cards/Cubs game. We have really been wanting to try to take Carter...he is 9 months now and LOVES to people watch so I think he would love it even if he doesn't watch the game. And OMG I love Mac's costume last year. I know I won't ever come up with anything that clever! That is too funny that we ended up making s'mores on National S'more day! What are the odds?